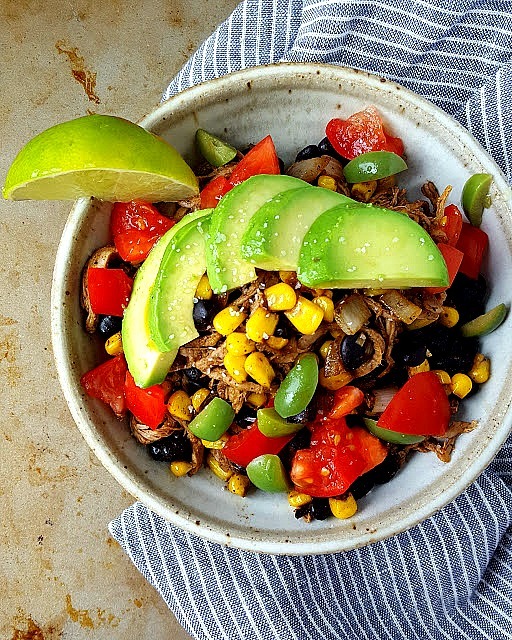 My Pressure Cooked Pork Bowl With Corn & Black Beans inspired by Skinnytaste recipe is THE perfect lunch bowl for fall. Yes, the weather is getting cooler, but it doesn't mean you have to load up on carbs and cheesy sauces. You can still eat a pretty healthy lunch or dinner that's satisfying, colorful, quick to make and is packed with a lot of flavor. I saw Gina's recipe for Crockpot Santa Fe Chicken and liked the use of cumin to spice up the black beans and corn. I did not have the time to make a slooooooooooooooooow recipe. Plus, I already had some pressure cooked pork on hand and decided to use that with a few extra ingredients (Castelvetrano olives!) to make my own version of Gina's dish. 1. Heat olive oil in a skillet. Add onions and saute for about 5 minutes or until tender. 2. Add corn and black beans, season with cumin, garlic and chili powders and salt. Saute until cooked through. 3. Add pulled pork and warm through. 4. Serve the above mixture in a bowl topped with diced tomato and sliced avocado. 5. Squeeze lime juice on top of the bowl and add olives. Optional: top with fresh cilantro. This was such a satisfying meal. You can make it a bit more substantial by serving it on top of a roasted sweet potato or roasted diced butternut squash.